Condo windows open to island breezes overlooking swaying coconut palms and the sparkling turquoise ocean. For your comfort and convenience, all the spacious Key West condo rentals include either a view of the lush tropical courtyard and island or a fabulous ocean view. Each suite has a fully-equipped kitchens, full size washer and dryer, private parking and oversized balconies. In addition, enjoy the olympic sized heated pool, 3 tennis courts, oversized jacuzzi, BBQ facilities, sun deck, botanical gardens, 24 hour security. Internet in most units and private ocean frontage. 1800 Atlantic Suites is located at 1223 White Street, Suite 102 (Check-In Only), Key West, FL 33040. This is a 30 minute walk from Duval Street and 50 minutes from Mallory Square. The Historic Seaport area is a 42 minute walk away. You can walk to Higgs Beach in 10 minutes and Smathers Beach in 7 minutes. Newly remodeled guest suites with private balconies and terraces enclose a secret garden sanctuary at this hotel resort and are perfect for couples as well as group travelers. The clever attention-to-detail extends to each of our stunning two-bedroom guest suites. Full kitchens. Candies on your pillow at turn-down and locally baked muffins for breakfast served each day. Full concierge services, fitness center, and bicycle rentals are other elegant perks you will remember long after you have returned home. Santa Maria Suites Resort is located at 1401 Simonton Sreet, Key West, FL 33040. This is a 3 minute walk from Duval Street and 25 minutes from Mallory Square. The Historic Seaport area is a 21 minute walk away. You can walk to Higgs Beach in 12 minutes and Smathers Beach in 36 minutes. Southernmost Sanctuary is on the south side of the island about one block from Duval street. Contact Key West Vacation Rentals regarding minimum stays and special rates. Minimum stay requirements apply on weekends (at least 3 nights), Winter/Spring season (January 2nd - April 30th - 5 night minimum). A classic 1950s art deco style motel with 2 levels surrounding a lush, tropical garden and fountain. Rooms feature original Cuban tile floors and jalousie windows, both of which have been enjoyed by keys residents for generations. El Patio also has a private roof deck, which is wonderful for both sunbathing and stargazing. Bicycle rentals are available. Guests enjoy free parking which is always a plus in Key West. 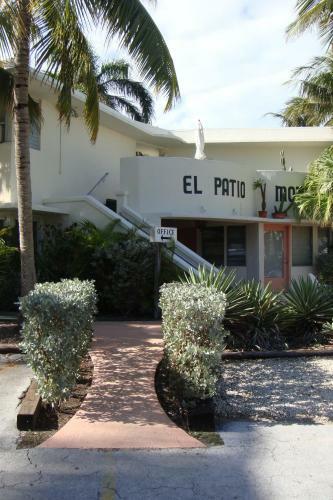 El Patio Motel is located at 800 Washington Street, Key West, FL 33040. This is a 7 minute walk from Duval Street and 30 minutes from Mallory Square. The Historic Seaport area is a 23 minute walk away. You can walk to Higgs Beach in 6 minutes and Smathers Beach in 30 minutes. Suite Dreams Inn is a boutique hotel and guest house nestled in the heart of the tranquil Casa Marina neighborhood of Old Town Key West. This Guest House offers 1, 2, 3 and 4 bedroom suites. Suites include private entrance, living rooms, well equipped kitchens or kitchenettes, comfortable king and/or queen beds with designer bed linens and flat screen TVs with cable. Take a dip in the sparkling, heated, lagoon style dipping pool to relax and unwind. The secluded tropical garden is perfect for reading a newspaper with your morning coffee or enjoying a good book with an afternoon cocktail. Suite Dreams Inn is located at 1001 Von Phister Street, Key West, FL 33040. 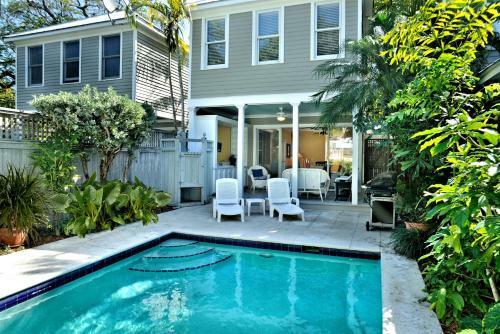 This is a 12 minute walk from Duval Street and 32 minutes from Mallory Square. The Historic Seaport area is a 26 minute walk away. You can walk to Higgs Beach in 6 minutes and Smathers Beach in 28 minutes. Three historic cigar houses located on a private compound in the charming historic district that lies four blocks from Duval Street and three blocks from the Atlantic Ocean. Our Margarita and Royal Poinciana Key West cottages feature one bedroom sleeping up to two persons and one bathroom, plus a fully equipped kitchen. The Robinson Crusoe Cottage is larger, with a separate living room containing a sleeper sofa comfortable for two additional people for a total of four. In addition, each cottage a has a patio, and shares the lush tropical garden, and heated swimming pool. 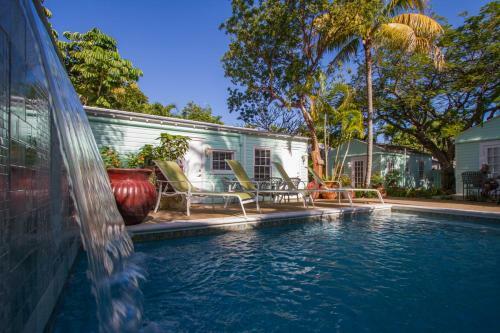 Conch Cottages of Villas Key West is located at 1124 Margaret Street, Key West, FL 33040. This is a 9 minute walk from Duval Street and 25 minutes from Mallory Square. The Historic Seaport area is a 18 minute walk away. You can walk to Higgs Beach in 10 minutes and Smathers Beach in 34 minutes. A 19th century Key West Eyebrow House and a Garden Cottage. Both are fully equipped and enjoy a shared heated pool in a tropical setting in a quiet part of Old Town near the seaport, Mangia Mangia, and Michaels restaurants. Eyebrow House and Garden Cottage is located at 522 Margaret Street, Key West, FL 33040. This is a 8 minute walk from Duval Street and 16 minutes from Mallory Square. The Historic Seaport area is a 5 minute walk away. You can walk to Higgs Beach in 21 minutes and Smathers Beach in 43 minutes. Offers 12 guestrooms, 10 with private bath and 2 with a shared bath, that surround an intimate lagoon-type pool in a tropical courtyard. The Garden House is a cozy, island-style inn, very centrally located. It is tucked away in a garden setting off the main path, yet only a block or two from the restaurants and bars of Duval Street, diving and sunset cruises, the Historic Seaport, the Conch Train station, and museums of Mallory Square. Garden House is located at 329 Elizabeth Street, Key West, FL 33040. This is a 4 minute walk from Duval Street and 10 minutes from Mallory Square. The Historic Seaport area is a 3 minute walk away. You can walk to Higgs Beach in 25 minutes and Smathers Beach in 46 minutes. New Orleans House - All Gay Male Guesthouse is located at 724 Duval Street, Key West, FL 33040. This is a 0 minute walk from Duval Street and 13 minutes from Mallory Square. The Historic Seaport area is a 13 minute walk away. You can walk to Higgs Beach in 23 minutes and Smathers Beach in 47 minutes. Centrally located in Key Wests Old Town, this intimate Florida inn offers bright, tropical rooms. A microwave, refrigerator and coffee facilities are provided in each cheery room. The comfortable rooms boast private baths, air conditioning and cable TV. An Island Oasis is located at 630 South Street (Checkin at 913 Duval Street), Key West, FL 33040. This is a 3 minute walk from Duval Street and 26 minutes from Mallory Square. The Historic Seaport area is a 22 minute walk away. You can walk to Higgs Beach in 11 minutes and Smathers Beach in 31 minutes. All self-catering apartments and houses by Key West Vacation Rentals are located in Old Town Key West within 1 mile of Duval Street. Features include either access to a private or community outdoor pool or a hot tub. Key West Vacation Rentals is located at 1075 Duval Street Suite C22 (Check In Address Only), Key West, FL 33040. This is a minute walk from Duval Street and minutes from Mallory Square. The Historic Seaport area is a minute walk away. You can walk to Higgs Beach in minutes and Smathers Beach in minutes.